Baby, it's cold outside. 19F yesterday morning, 22 this morning. The vines from missed potatoes that sprouted this fall have flopped over and are turning to slime. The calendulas finally bit the dust. Squirrels, who have madly squirreled away what looked like record numbers of acorns this year (it's what is called a "mast" year) have gone suddenly quiet. The chard is holding up so far, but is the likeliest of the greens to give up of what we have out there. Kale, collards, cabbages, beets, mangels, radish, turnips, Brussels sprouts and even onions are looking good. I picked a few good apples from among the many that are turning bad from frozen spots. I have just opened the garden fence for the ducks and chickens, earlier this year. It's easier than carrying greens to them, and it's clear that the peas (at center, above) won't do much now, so the destructive hens might just as well have a go at that bed along with the others. As the ground thaws, the birds will find critters that I'd prefer not to see in next year's garden, so it's all good. 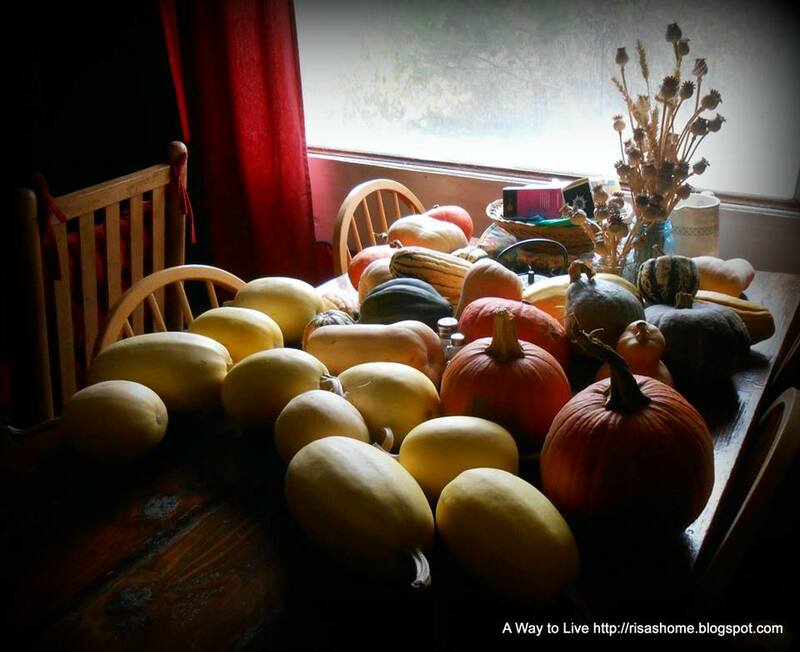 We did poorly with winter squash this year, but reasonably well with pie pumpkins, so we traded most of the pumpkins for squash. Can you say "ready for the holidays?" 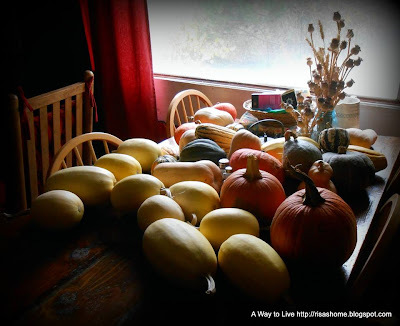 They're sitting on the table at present because the room with the fire in it gets the nod for "best place for squash." They would mold anywhere else. One by one, they're popped into either the oven or a stock pot on the wood stove, and we feed some bits to ourselves and some to the poultry. At last we're digging into the wood pile. It was a warmer October and November, till yesterday, than it looked, and we got by on fallen sticks and twigs for the most part. Now I am back into the routine of making dishwater and bread and soup on the dining room stove; it has been awhile. There's tea to be made as well; and apple juice -- which we move from Mason jars on the shelf to a stoneware pitcher on the stove, for a bit of hot cider coming in from chores. If a Fascist army ever comes down the street, as they do at the end of May Sarton's early novel The Bridge of Years, we may say to one another, round this fire, something like the final benediction of Sarton's heroine. They will, perhaps, take from us everything. But they cannot take from us what we have been.